As parents and caregivers, we all want what is best for our child. We want to make sure that our child is happy, feels loved and grows up to be a good person. Some parents want this so badly, that they insist on making all of their child’s decisions, as well as sacrificing everything, to protect their child from the world and everyone in it. These parents are often referred to as “Helicopter Parents”. Helicopter parents hover over their children like helicopters, constantly rescuing and protecting them from teachers, other kids, and the rest of the cruel world. They rush to prevent any harm from befalling their children and interfere with letting them learn from their own mistakes, sometimes even against the children’s wishes. This style of parenting can send a message to the child that says, “You can’t help yourself. I have to do things for you.” This may do more harm than good, causing the child to grow up fragile and unable to make good decisions or take on a leadership role in their own lives. Take a step back and allow children to make their own decisions, be held accountable for their actions, and take ownership of their own problems. It will help them become better leaders and build their confidence. If we encourage resilience and reward perseverance, we teach our children that we believe they are strong enough and smart enough to do things on their own, and give them the tools they need to become responsible, capable adults. Fay, J. (1995). Helicopters, Drill Sergeants and Consultants: Parenting Styles and the Messages They Send. Love & Logic Press. 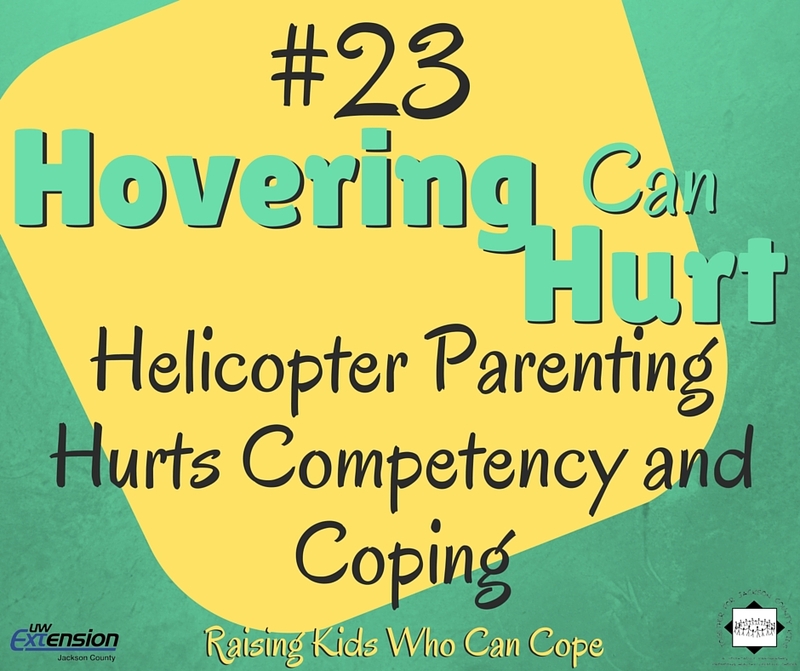 This entry was posted in Raising Kids Who Can Cope and tagged coping skills, parenting, resilient, youth. Bookmark the permalink.